The Problem: The radiation dose resulting from a proton passing through living tissue has a sharp, narrow peak, known as a Bragg peak. In certain cancer therapies, the desired radiation dose should have a broad, flat peak, where the flat section corresponds to the extent of the tumour being treated. The problem is how to deliver the dosage in a broad, flat distribution when the radiation is naturally deposited in narrow Bragg peaks. Background: Proton Beam Therapy uses protons to fight cancer. Protons are stable, positively-charged subatomic particles with a mass 1800 times that of an electron. Protons slow down relatively fast when entering biological tissue, and most of their energy is deposited, with little scatter, at the end of their path in a peak called a Bragg peak. The depth at which the peak occurs can be controlled by the amount of energy the protons are given by their accelerator. The proton's dose of radiation is released in an exact shape and depth within the body. Tissues in front of the target receive a very small dose, while tissues adjacent to the tumor receive virtually none. The medical value of this effect was first published in 1947 in a paper entitled "Radiological Use of Fast Protons" by Robert R. Wilson. Proton beam therapy has demonstrated success for the treatment of selected tumours. More than 20,000 patients have been treated with protons or light ions in research laboratories or hospitals around the world. Solution: To begin with, we have an empirically measured Bragg peak that describes the radiation dose along the path of the proton. We fit this data to a smooth curve to describe the peak as a function. We can spread the peak by adding together a weighted set of these functions with various shifts in the independent variable. This corresponds to using protons at different energies and intensities. Extrema calculates the best weights to apply to each function in the set, so that their sum results in a flat spread-out Bragg peak. This script allows the user to explore how these functions can be used to attain a flat distribution across the desired range, by supplying the number of functions and their relative shift with respect to each other. The script plots the weighted individual functions and the spread-out Bragg peak that results from them. It also creates an output vector containing the calculated weight values. 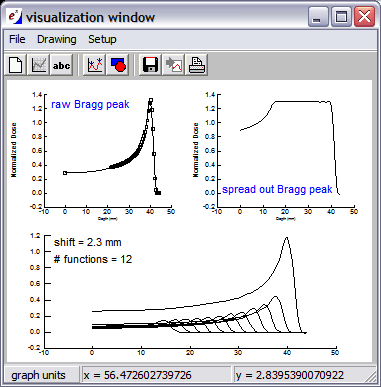 Click here to upload data for raw Bragg peak.